Our micro bakery has limited capacity in more ways than one. Still not a week goes by or we are requested to make more bread. We then have to explain that yes, we have a bigger than normal bread oven, but it still turns out a maximum of 6 breads at a time. And our bread recipes take 2 to 3 days from start to finish. We love the smallness of it and the attention you can give to detail, really trying to make the best bread possible every single time. Besides our ‘normal’ bread production we also like to try out new stuff with different types of flour, starters, shapes and sizes. Of course not all of these experiments are an instant hit. 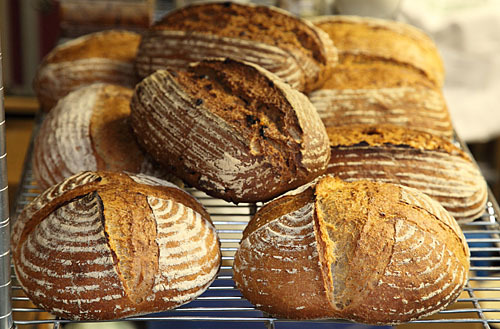 It takes a lot of time and breads before a recipe becomes consistently good. Although it is not our goal to bake as much bread as possible, we would like to get our hands at a second Rofco bread oven. We would be able to do some parallel baking between us. Pain rustique in oven nr.1, buns in nr. 2 for example. And it would be cool, just for fun, to see how much bread we would be able to produce in one day. Our family and friends would not mind. Up till now they always eat faster than we can bake! This week my father walked the famous 4 days marches (Vierdaagse) in Nijmegen, Holland, the biggest long distance marching event in the world. I baked fresh loaves for him and his ‘motor’ kept running all the way to the finish. Good for you Dad, Congratulation!